The current talent drought presents many problems for small to mid-sized businesses trying to build an internal accounting department. If you began your business as a solopreneur or a small start-up, chances are bookkeeping was something you did in addition to your more pressing duty of running the business. Savvy executives and owners don’t want that kind of distraction and quickly embraced outsourcing to address accounting and other functions. Any departmental function that was outside the core competencies of the business (e.g. engineers for engineering companies, coders and designers for software companies, researchers for biotech companies) was outsourced. Common examples of outsourcing include legal, IT services and payroll services. It was easier and more effective to tap the expertise and economies of scale that are part and parcel of the outsourcing model. In most cases it was less expensive than hiring and bringing people (and tools, software, etc.) in-house. This discovery of optimal efficiency, at a low or reasonable cost, led to an explosion of firms offering outsourced services – including specialty functions such as marketing, field service, and the outsourced accounting services. We are one of those firms. The people at Edward Thomas Associates (the team who operates a virtual accounting department on your behalf) are veterans of the accounting profession. They have worked as auditors with the Big Four accounting firms and held company positions as CFOs and Controllers. What about you? Are you struggling to find someone to handle your accounting? Are you still attempting to complete accounting duties whenever you have a spare minute – which is increasing rare? Have you been frustrated trying to hire staff for the accounting function? It’s not an uncommon problem. There simply aren’t many qualified candidates in the market for a new accounting job. This talent drought presents many problems for small to mid-sized businesses trying to build an internal accounting department. The most talented and promising candidates have many more choices and can demand higher salaries. They will also likely go somewhere where a career path is visible, that is, an organization with an established accounting department where they can be promoted to Senior Accountant, Controller, Financial Analyst, or CFO. When you outsource, you get a team of qualified accountants working on your behalf. Reports are on time. Best practices are applied to workflows. Reporting is set up correctly. Tasks are completed on schedule. You are prepared for an audit. And, you can make critical business decisions armed with real-time financial information. In most cases, our monthly outsourcing fee is less than what a full time employee would cost your organization. 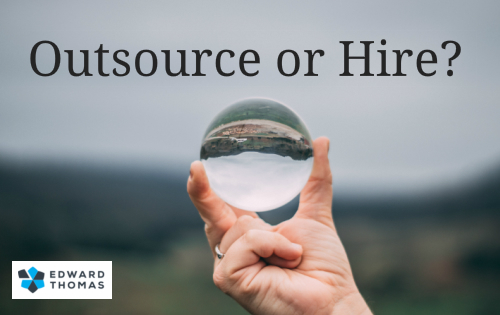 Take 15 minutes to talk to a team member at Edward Thomas Associates about how outsourcing might work for you. We think you’ll be pleasantly surprised at how easy, affordable, and beneficial this solution would be. We're always open to a conversation about how we can help your business. Request a free proposal to see how we can help your business run more efficiently. © 2015 Edward Thomas Associates. All Rights Reserved.